The Tristan group is home to two species of seal (pinnipeds or Pinnipedia), with several breeding colonies. Having been overexploited by sealers in the 19th century, numbers are now recovering. Fur seals are the most common seal species in the Tristan group. There are breeding populations during the summer months on all of the main islands, and they may haul themselves out on most of the island beaches. 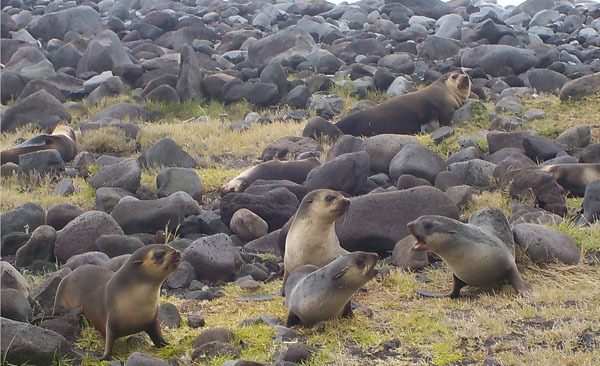 below: A group of subantarctic fur seals Atctocephalus tropicalis on the Tristan settlement plain. 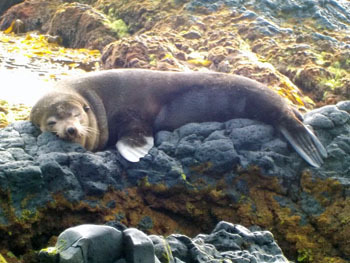 Note how well the fur seals are camouflaged against the grey lava boulders. Elephant seals, or sea elephants, are less common. There is currently only one breeding colony, on Gough Island, although they do also visits the waters and beaches around the main group of islands. Their main breeding ground is famously much further south on South Georgia. 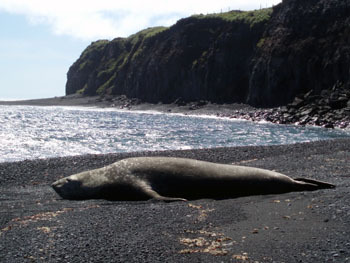 right: A southern elephant seal hauled up on the beach at Flat Rocks, Tristan island. Sealers, mostly from the United States, hunted the seals at Tristan during the late 18th century and the 19th century. Typically, a party of men was left on an appropriate beach with supplies and the necessary equipment. They then proceeded to slaughter all the seals they could find - the fur seals mainly for their pelts, and the elephant seals mainly for their blubber. Paintings by the Victorian artists Augustus Earle show a sealer flensing a young sea elephant, which involved skinning the animal and cutting the layer of blubber into large blocks. 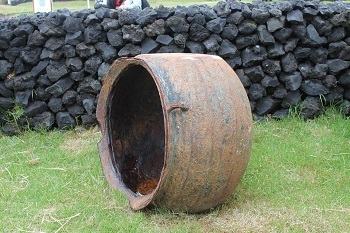 These were then tied together and rafted out to waiting boats for transport to the try pots where the blubber was boiled down to extract the oil, and stored in barrels until the ship came back to pick them up. An old try pot at the Post Office and Tourism Centre. Tristan islanders also took seals whenever they could, as the pelts and oil were good for trading with passing ships. The German Stoltenhoff brothers, who attempted to settle Inaccessible Island, intended to make their living by sealing. However, the earlier slaughter had been so great that the local seals had been hunted almost to extinction, which was a significant factor in the failure of their enterprise. Sealing no longer takes place, and numbers have slowly but surely increased. With Inaccessible and Gough Islands being designated UNESCO World Heritage Sites in 2015 and the plan to introduce of the islands' marine protection area by 2020, particular efforts are being made to conserve the seal populations.